Have you bought a Kindle yet? A Nook? A Sony Ereader? I confess, I haven’t…yet. At first I was fully opposed—hey, I love to hold a book, feel a book, even yes, smell a book. How could I take a Kindle into the bathtub with me? How can I lovingly dogear pages? How can I feel an embossed cover? Well, I can’t. But, an ereader offers other options that I really like. The option to store hundreds and hundreds of books at my fingertips. Some are backlit, which is perfect for bedtime reading. It makes carrying around a hardcover novel much easier. And the main reason I’m thinking about buying an ereader—instant gratification. Log on, click to buy, start reading. That kind of ability is really appealing. If you do have an e-reader, I have a recommendation for you (esp. those of you who love a bit of the psychic paranormal): Fellow Cozy Chick Lorna Barrett/Lorraine Bartlett writing as L.L. 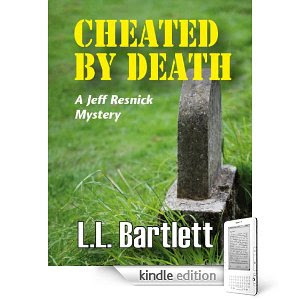 Bartlett has just launched the third book (e-edition only) to her popular Jeff Resnick psychological suspense series called Cheated By Death. It’s already getting some great reviews. Here's one from the wonderful Dru Ann. In this third in the series, Jeff Resnick faces a new dilemma: someone is stalking his sister-in-law, Brenda, who fears that violence from pro-life supporters will escalate near the women’s clinic where she works. Or could the vandalism, threatening phone calls, and letters against her have come from her abusive ex-husband? Meanwhile, Jeff grapples with meeting his estranged father and the sister he never knew existed. Could Patty Resnick be the key to Brenda’s stalker? And what has that got to do with the death of his brother Richard’s colleague? Check it out—you won’t be disappointed. At only $1.99 (this month’s special price) how can you go wrong? I have the nook too, but I'm eyeing the iPad. Thanks Heather and Lisa D. @Dru...I'm also eyeing the iPad. I love my nook but there is something about that iPad that just draws me in. I picked the nook because I was able to physically hold it and play with it in the store where I was not able to do that with the Kindle. I also like that I can lend books out to other nook users. Now you can use your wi-fi and browse the internet. @LisaD...I totally agree about the coupons. The other day I got a free danish and all I did was walk in the store with my nook. I agree with Dru, being able to hold the nook and actually play with it before I made the purchase was a big plus. I also like the fact that you can lend books. The latest software update from B&N really enhanced the nook experience for me. Wi-fi seems better, there are two games and a web browser. If I was going to buy a dedicated e-ink device again, it would be a nook, Heather. Heather, you've seen what I have. If you're going to make a long term investment in ebooks (as in duplicate your physical library plus buy new in electronic formats) I would recommend something like that instead of an e-ink device, and here's why: With what I have (which for those of you who don't know, is a convertible netbook/tablet), there are no conversion issues, and no having to buy from a certain store because your device only accepts certain formats. No worries about possibly breaking DRM to be able to use your books in the future, either. At the present time, there aren't any e-ink devices on the market that offer ability to read all DRM'd formats. However, mine does have some drawbacks - the battery life is one of them. On an e-ink device like the nook, you will get approximately a week of battery life with heavy usage. With mine, you're lucky to get four hours. Mine also is heavier than a nook, though not by enough to be a major concern to me, that might be a factor to you. The initial investment is higher on something like what I have, also, $500 compared to $259 for a nook. The best advice I can give you is do your homework - and decide what device best suits your needs. Wow, thanks, Shel! That's a lot of great info. IF I get an ereader, I'm leaning toward Nook. But I'd like to see a Kindle. Have to find a friend who has one! I was going to buy the nook, but then I got an iphone for Christmas and discovered that you can download the kindle app for free! So I have an ereader with me all the time. 'Though I think I would love the ipad!